All card games I've played allowed you to have up to 3-4 copies of most cards and unlimited of special types such as mana or army cards. Would it be fun playing a 60 card deck of only single copies of units and spells? Would it eliminate combo decks or allow you to have more adaptability to more extreme situations? If so, should the deck be made smaller, 40-50 cards? Only allowing 1 card of each kind has a stifling effect on both card design, and distribution design. If you build a deck with synergy, you will want to have either multiple cards of the same name, or multiple cards that are very similar to each other. If you make too many cards that are too similar, you either need to make thousands and thousands of cards, or many cards will feel like doubles. And on the idea of doubles, if you can only use one card of each name, then the value of every card (beyond the first) is 0. Imagine opening a new pack of cards and every card is useless to you, except perhaps for trade fodder. A ccg needs to allow multiples, at least with most cards. Some cards games have restrictions like "only 1 of this particular card per deck" but this has its problems too. Every single "search" card has the potential to get this one card, so the cool utility of searching for a specific card for the situation has to be costed as if it were getting one of those 1-of cards, which will make the search card ill-suited for its intended role. I think the 1-of restriction is only a measure done to try to balance the power of a card ex post facto. In other words, if you design power levels correctly in the first place, you wouldn't have to do things like that. On the other hand, allowing too many cards of the same name will also be bad. That encourages people to make fewer choices, and more and more cards will need to be compared against the very best cards (which they are competing with for a spot in the deck). 6. How much synergy do cards have with each other. 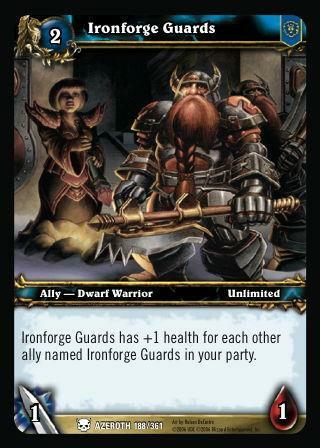 Look at other card games and see what they use, and more importantly why. 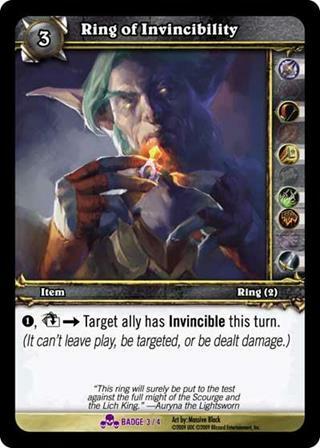 Also look at other CCG's mistakes. Magic originally had no card limit, and people made decks of all lightning bolts. That made for very boring, imbalanced games. If the 4-of rule weren't introduced, Magic would have died out pretty quick. Instead of a deck construction limit, I think a better way to balance things is a limit on how many can be in play at a time. Magic does this with the legendary rule. WoW CCG, a more modern CCG design, has a far more robust system for this sort of thing. They have slots like Ring (2) which means you can have only 2 "rings" at a time in play, or form(1) meaning you can only have one kind of form in play. There are also special cards that can break this rule. Magic has a few cards like Relentless Rats, which specifically states that you can have any number of that card in a deck. WoW, again showing its more evolved design, has this keyworded. I have to agree with Trevor here: using 60 different cards hurts synergy. I also think of how many clone cards you will have (think similar effects, sort of like in Yugioh with Reinforcement of the Army, E-Emergency Call, and Summoner's Art all having the same effect of adding monsters from your deck to your hand); I personally think it's boring to have multiple cards do the same exact thing. There are several more search spells like those I didn't mention. I think of the 2 tcg's I made, that Yugioh Game Master which no one replied to, and Quickstrike which was based on an rpg maker 2003 game I made. I'll go into details with playing Insanity, which is the style of play known through the Vs. System tcg of having a deck with single copies of each card (it had 60 card decks). In short, insanity rewarded the player with bonus effects for cards if they did not use any duplicate cards. However, the benefits did not outweigh the costs of inconsistency and the scarce amount of cards with this insanity effect (17 cards in total with only 6 good ones). With Yugioh GM, I had set up a deck for only 20 unique cards (barring stuff like Thunder Dragon which can get itself) given that it becomes difficult to support a theme with a limited card pool. There are some themes that absolutely can't be run, like Gravekeeper's due to this restriction. With my Quickstrike TCG, multiples were needed in order for combos to be run (it used 40 card decks) as well as a focus ability, which I derived from the powerup ability in Vs. System by discarding a card with the same name for a temporary power boost. I think a lot of trading card games either have 3 copies for 40 card decks or 4 copies for 60 card decks; you want to have a balance between consistency and chance. I think your best bet is to go with a sealed or draft route of either a tcg already made, like Magic: the Gathering, to use all sorts of cards, or use a small deck limit like in the Yugioh GM I made. All in all, the most important thing in making a trading card game is finding at least 1 person who likes it and is willing to help you modify it over time to improve it (especially when you make new cards and phase out old ones, to see how you can remake the old ones to make for a faster yet more balanced game). I'm glad I was able to do that with both games I made. its called elder dragon highlander, or more commonly known as edh. They recently switched its name to commander, for reasons unknown to me. 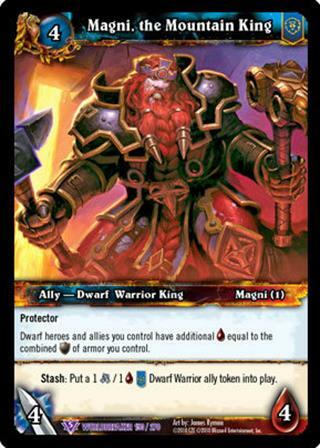 the deck consists of one legendary creature as your "commander" and a deck of 100 cards including the commander. excluding basic lands all cards cant have the same name as another card. all cards must be the color or colors of your commander, including artifacts. your commander cant have any activated abilities that require mana that isnt in your commanders casting cost (thus memnarch is out of the loop). you're allowed to use cards that are legal in vintage, excluding cards on the banned list. Highlander is a variant that all games can do. It's fun and challenging for deck building but it's not something everyone plays. Not many games go with the single card restriction. If you do go with it I would recommend on having a smaller deck size about 30-40. however as a whole, I tend to go with a 3/50 deck construction for my games. sometimes you just need more than just one copy of a card and combos are a good thing to have in a game. You want there to be multiple play styles for people to use in deck building. So even if you hate control decks, there are people whom love to play that way. Best way to think about it is, how many times have you desperately needed to draw card X against someone in order to win but never seen a single copy of it? Not a fun feeling. but this also goes into card design where some games make it so you need to use a "counter" against something in order to stop it. Plan out what you want to do and then you can work on thinks like limit of cards and deck size. IMO I don't think having that card restriction would be more fun or provide any benefit. As already mentioned VS has an "insane" deck or text that you can use if you use that single card restriction. But the concept is gaining text and thus abilities for having that penalty. While I haven't tried it out yet, I would like to. Although I heard it's really not worth it. Still too restricted. I have approx. two cents to add here. The WWE Raw Deal card game was an excellent example of adding the "Unique" trait to offset the power level of cards. As far as cards that search for other cards, only "unique" cards could search for "any" cards, and other cards that allowed a search only let you search for "Non-unique" cards. Setup - You may pack any number of these cards. Your deck must contain exactly 60 cards. To this day, Raw Deal remains my favorite game engine. Not that I would straight up say that singleton is a good idea for a game (although I posed the same question as you a little while ago in this very forum), but I will definitely say this: it's all in the design. EDH works because there are thousands of magic cards already in print, which is exactly what you need to have a rule of 100 card decks with 1 copy of each card. I designed a game where you could only have 2 copies of a card in a 25 card deck, and drawing was very restricted. Playtesting has shown that that aspect of the game isn't bad, and allows for a lot of design space as well. So, it's all about coming up with rules and cards that have synergy in the first place. If you're making a 60 card singleton game, you know you probably shouldn't print Lightning Bolt (or some such equivalent) because the overall power of the card just won't seem like enough to warrant a spot (unless you haven't made enough cards, which is worse). I counterbalance having only a 25 card deck with 2 copies of cards by making the cards "busier" so that each one can take the roll of several different cards, in an mtg scenario. Marketing is, however, going to be weird with a singleton game. If you aren't planning on using packs and other "conventional" means then it isn't as big of a deal. Maybe you plan on selling the whole game all at once? Then singleton may be perfect. Final point: I'd reduce the deck size to 40, maybe lower, depending on the type of game you're making. It'll save card design time, deck building will be one third less frustrating, etc. Just thought I'd add, that in a game like magic where there enough different cards to create a format like EDH/Commander, a singleton or highlander ("there can be only one" reference) format, that combos are still quite possible and in fact easy to achieve at times. There are cards, even in EDH/Commander that are banned because of the possibility. For those familiar with magic, it's very easy to take the bulk of the vintage restricted list, throw in some other decent draw and tutor spells, and come out with an excellent storm deck. It is slower in EDH/Commander, but can still pull off turn 3 or 4 kills of up to 5 or more players including counterspell support. I put it together for the sole purpose of putting other "I combo and win HAR HAR" players in their place. It's a completely dreadful process to actually play out, however, and feels comparable to the CCG version of masturbation. Once I had a game with 3-copies limit but each copy should have had a different color out of 3. Eg you could have Hipster (green), Hipster (red), and Hipster (blue). Some cards had interactions between cards of the same color. I am making a mathematical CCG which goes by 3/48 and a snakes and ladders CCG which goes by 6/60. Is that a bad idea?